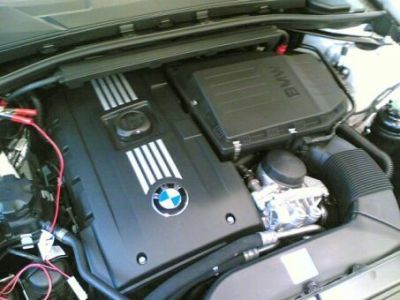 Notice to all BMW owners that drive 3 & 5 series cars from 2006 that have the N52 and the N54 motors; OR the 3.5 liter turbo and the 3.0 non turbo motors | Atlantic Autowerks Ltd.
What is happening is the drive belt is getting saturated with oil from the oil filter adapter housing seals and causing the drive belt to fail. The PROBLEM is: the drive belt is being slithered thru the front crankshaft seal in to the motor thru the timing chain and sprockets, which is shredding the drive belt into very small pieces of rubber, and then into the oil pan. The tiny particles of rubber start getting sucked into the intake tube of the oil pump which grinds them up to even smaller pieces that now can clog up every oil passage, nook and cranny that has been built into the motor. Eventually, the oil pump screen clogs completely up and the motor will not have any oil pressure at all to major components of the motor that need the lubrication. Essentially, the entire motor assembly will have to be replaced. Anything that the oil flows through will have to be replaced. This problem has been the most prevalent on the 3.5 turbo motor, but the 3.0 non-turbo motor has the same set-up and can happen just as easily. The 3.0 liter non-turbo motor has a problem with the belt tensioner starting to lean towards the radiator after the car has a few miles on it, causing the drive belt to be crooked on the pulley. If the belt breaks, the possibility is there where the belt can slither thru the front crankshaft seal, like above. So far, most have not! The moral of the story is: if the drive belt has oil on it ........ or is not lying flat all the way on the pulley surface, GET IT FIXED ASAP!